Today I provide you a list of the best motivational never give up movies from the big screen. If you are struggling to find inspiration, thinking of giving up on your goals, take out some time to watch the full movies and let them revitalise you. In many people’s life, there comes a time where they hit upon hardships and lose their spirit to keep going. After my own personal battle with ill health I know how we can get extremely down on ourselves, and how essential it is to find something that can raise our spirit. Not giving up is a mindset. And it’s a mindset that you can adopt. Even if all the tables are turned against you, keep on going, refuse to give up, no matter what. I keep going when things get tough. Every problem has a solution, and I will find the way. Every day in every way I move forward, nothing can stop me. Not always easy to do this, is it? There are time when you feel the energy sapping out your body and your mind spiralling into freefall. It is at these moments you need something to steal your focus away from your problems and give you a shot of motivation, and to me nothing can do this better than awesome motivational never give up movies. My family through its Pearl and Dean connections has always had a great love for the cinema. Cinema has the power to move you, inspire you and of course motivate. I’ve always believed that movies possess an incredible power to lift the human soul, and the motivational never give up movies that I include here are powerful examples of this. 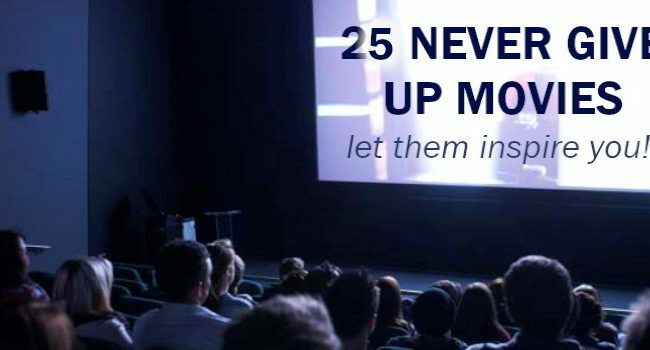 I have compiled a list of some of the best motivational never give up movies from the big screen to help you through those tough times, check them out, and let them inspire you once more. Sitting down to watch these movies can be helpful when you feel like quitting. I’m a teacher, it doesn’t matter what color I am. Eva : It’s all about color, it’s about people deciding what you deserve, about people wanting what they don’t deserve. I know what I have to do now, I’ve got to keep breathing because tomorrow the sun will rise. Who knows what the tide could bring? There you have 20 never give up movies that truly can inspire you. Watching them will remind you to never quit, but persevere and see things through, until you succeed. Take the time to watch each of these movies to boost your mind and empower you. As a bonus I would recommend highly checking out one particular movie that I know has changed an enormous number of lives. This is a bonus to you, but I urge you to watch it because anyone looking for never give up movies will benefit from watching this. If you have any inspirational never give up movies that you seek out to motivate you, let me know by commenting below. Let’s share the empowerment.